Our 2015 retreat was held on April 23-26 at the Franciscan Guest House in Kennebunk, Maine. 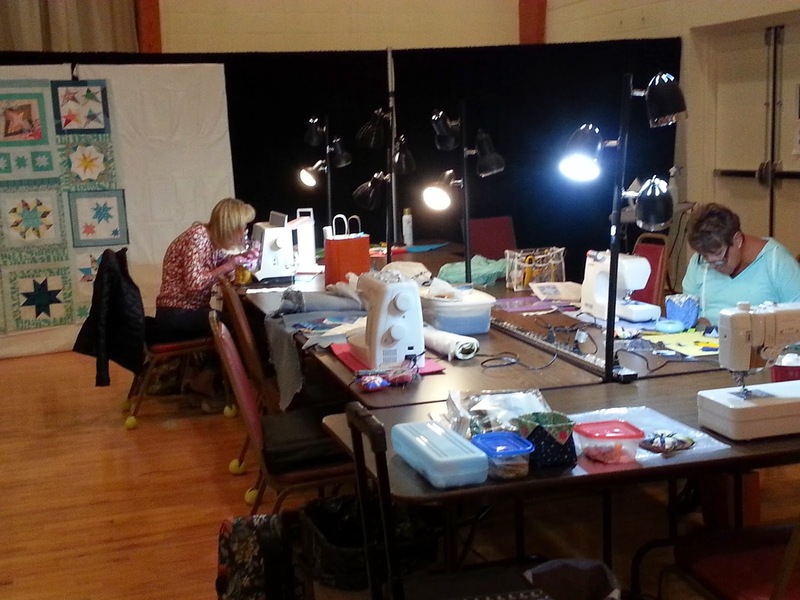 We had a small, intimate group this year--sixteen of our members were able to attend--and by a lucky chance, we had a very large space in which to sew. We may be a little spoiled now! Mary's first real pincushion--the handmade swag was a hit! Nancy and Sue were among the first to arrive, and they brought a trunk full of swag, giveaway prizes, and treats to share. Nancy and Sue also found, purchased, and donated enough prizes to hold hourly giveaways on Friday and Saturday. 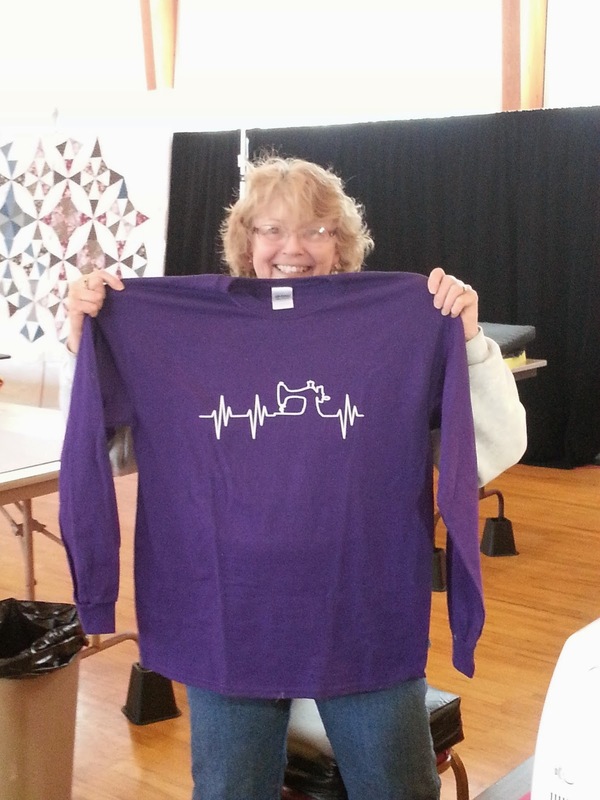 Paula won one of the best prizes in the pile--a sewing heartbeat t-shirt! Because our retreat weekend was so "late" in the spring this year (end of April, instead of end of March), we were much more able to enjoy the outdoors. It was still in the high 30's those mornings in Kennebunk, but there were walks along the beach and downtown to be enjoyed. But we all know most of the action happened in the sewing room! 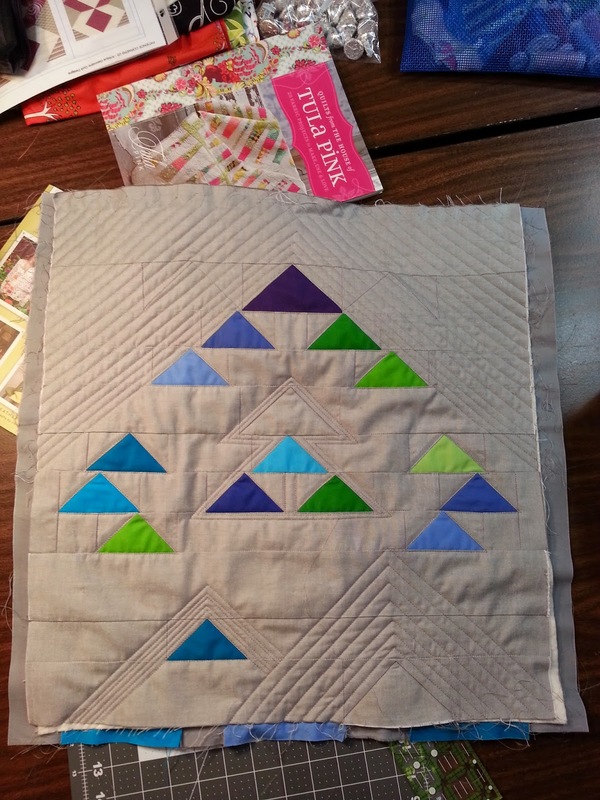 Many people worked on their Modern Traditional Challenge minis for A Quilter's Gathering. I was also amazed at the amount of design work going on on the design walls. We had so much space at the Franciscan, everyone had as many design walls as they wanted. 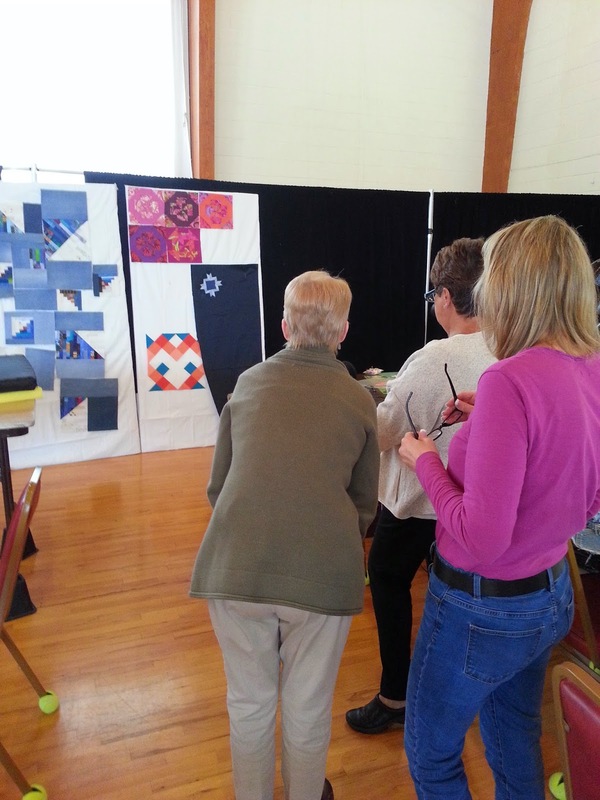 Many of our quilters took the opportunity to draft and refine their own quilt designs. We also found much common and uncommon ground amongst us. We had a lengthy discussion on Tina Givens's designs, and confirmed that many amongst us are Lizzy House fans. Mary may even have predicted, like a fabric sorceress, the reprint of Lizzy's Jewels! I also noticed that those ladies who actually sat at their sewing machines (instead of spending their time at the snack table or walking around bothering people, like yours truly) got a lot of sewing done! Barb and JoAnne working into the night. 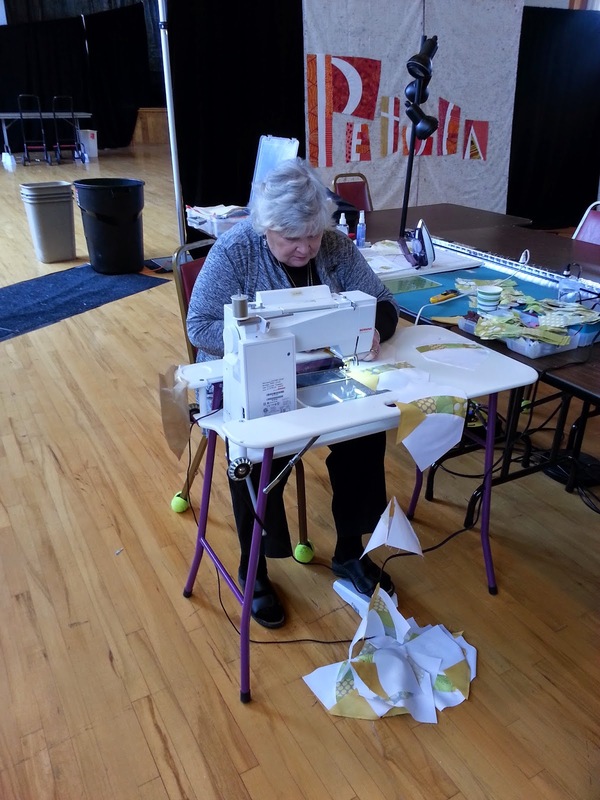 Barb was last woman sewing on Friday night! 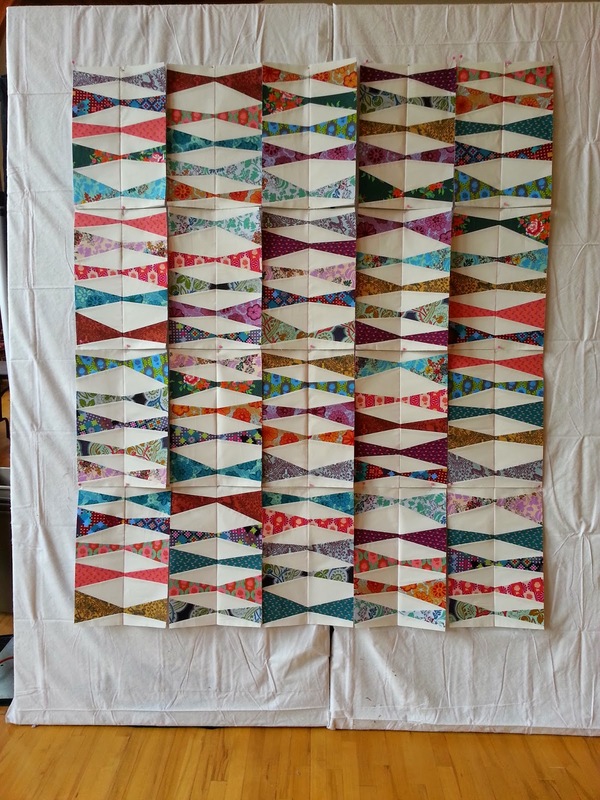 Finally, Judy finished assembling the Kite Tails quilt blocks for our raffle quilt (pattern by Amy Friend of During Quiet Time) and we pinned them up on the design wall for a beauty shot. I'll definitely buy some raffle tickets for this beauty! 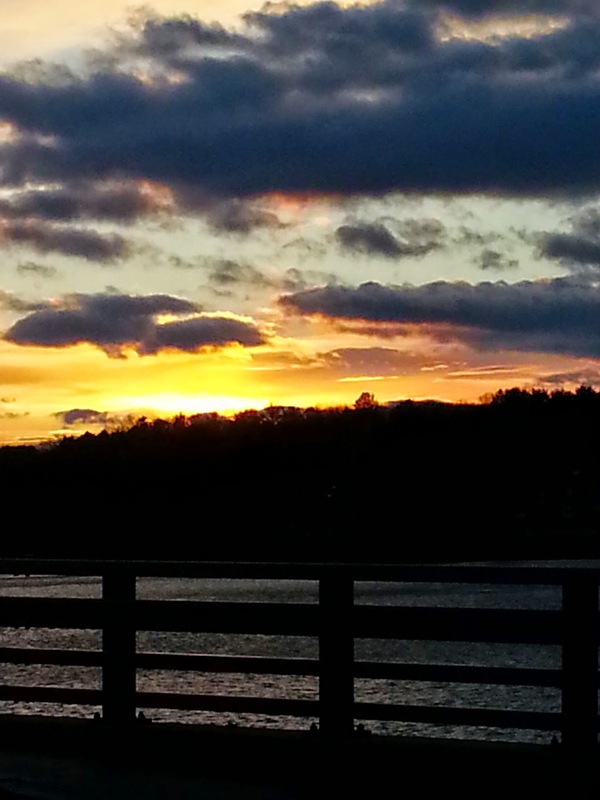 It was a great retreat. I hope we will be able to repeat it next spring! Our May meeting will be held on Saturday, May 2 from 10 am to 12 pm at the West Newbury Old Town Hall (the same place where we met for the April sew-in). Your projects for show and tell! We should have a lot saved up, as we haven't had show and tell since February. Your Modern Traditional Mini for The Gathering! 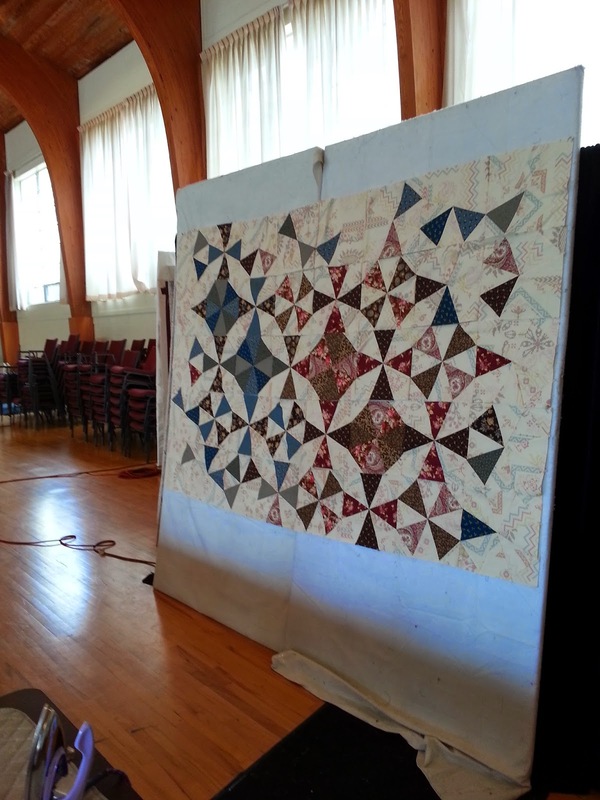 Remember, you WILL NOT see this quilt again until it is hanging in the show. All bindings must be completely finished; all labels and sleeves must be totally attached. Your mini needs a 2'' sleeve; use Jacquie Gering's tutorial but cut a strip 4.5'' wide x the exact width of your mini. Your Greek Cross blocks for the block lottery! If you have lost your handout, HERE is the tutorial over at Fresh Lemons. You only need to make one block per entry, but they are quick, so you are welcome to make more. You may use any color, prints or solids, but use a white or reads-as-white background. Mary will be giving away one FQ as a prize to a randomly-selected block lottery participant at this meeting. Peg's lime-and-grey Stacked Coins blocks! Please see instructions in Judy's email dated April 10 (if you are searching your email, the subject line is "Blocks for Peg"). These are not due until the June meeting but if they are made, they will be gladly collected. Each person who submits a Modern Traditional Mini for The Gathering show will receive a raffle ticket--we have three two-spool packages of brightly-colored Aurifil 50wt thread to give away as prizes! A big thanks to Aurifil for donating a thread collection to our guild to use as prizes. Prizes will be given randomly, raffle-style! Sunday, May 3 will be Sherri Lynn Wood's workshop Bias Strip curves, at the same West Newbury Old Town Hall venue. (NOTE: this workshop was a pre-registered event, and is for registered and paid attendees only.) Lunch will be provided. Please check your email for the supply list. The workshop starts promptly at 9, and you must already be set up and ready to sew by 9, so you need to plan to arrive early. If you will want other snacks or drinks throughout the day, please pack them along with you. If you ordered a book from Amy, please remember to bring $15 cash or check. We were thinking spring and thinking Kite Tails this past Saturday. We used this meeting to sew blocks for our raffle quilt for the Gathering later this year. Laura began by revealing the SMQG logo, inspired by our banner. Lots of possibilities exist to further the SMQG "Brand" with totes, tees and much more. Laura also gave a quick demonstration of creating sleeves for our mini quilts. The minis - your modern interpretation of a traditional block in solids - are due complete with 2" sleeve and label at the May meeting. Laura reported that the Riley Blake challenge fabric is still being rolled out. She'll check in on the MQG site for any updates. Amy said that the next MQG Charity Challenge should be announced in the next few weeks and we should plan time for discussion. Mary unveiled the lottery block pattern for the next two months - The Greek Cross featured on Fresh Lemons. The tutorial is here if you missed the handout. 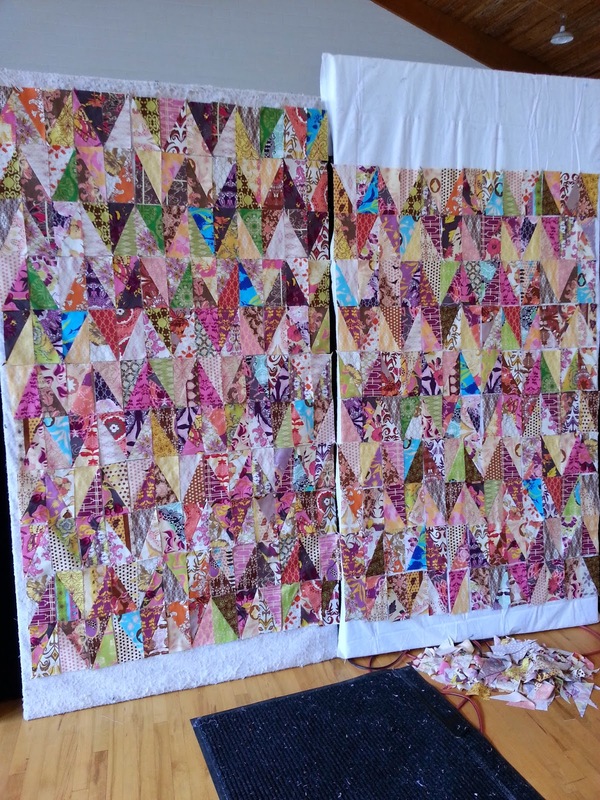 Mary says ... We’re going to go scrappy with these blocks, so use any colors and prints you’d like! 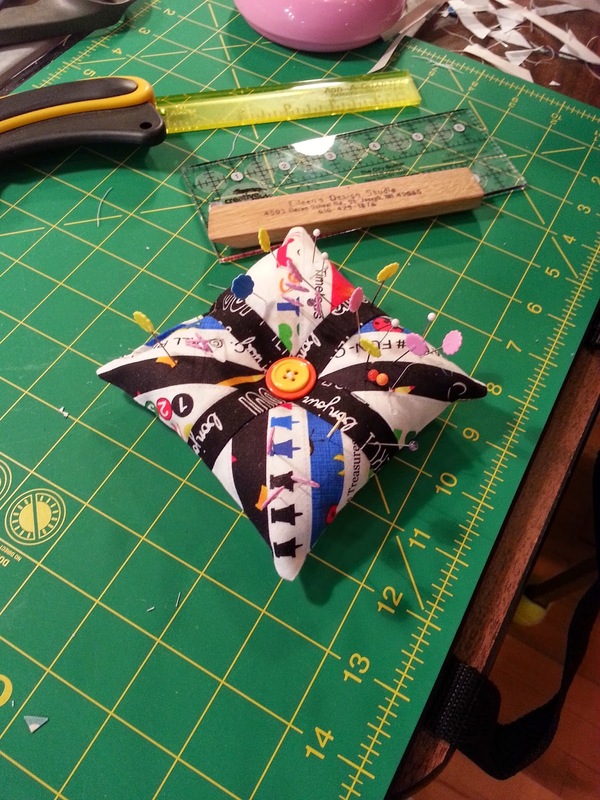 The center cross should be all one fabric, and the outer HSTs can be any other fabric. Just be sure to use a white or “reads as” white for the background! 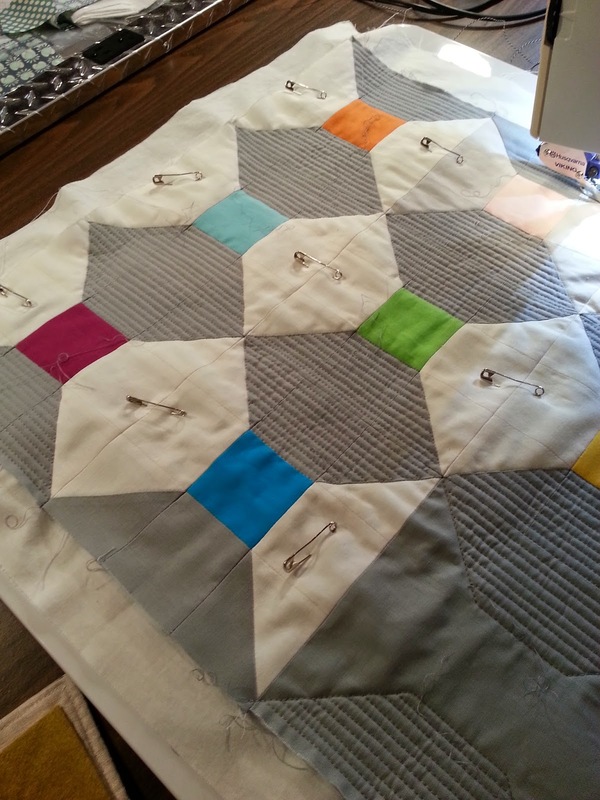 The raffle quilt features Amy's Kite Tail pattern with Anna Maria Horner's Dowry line. 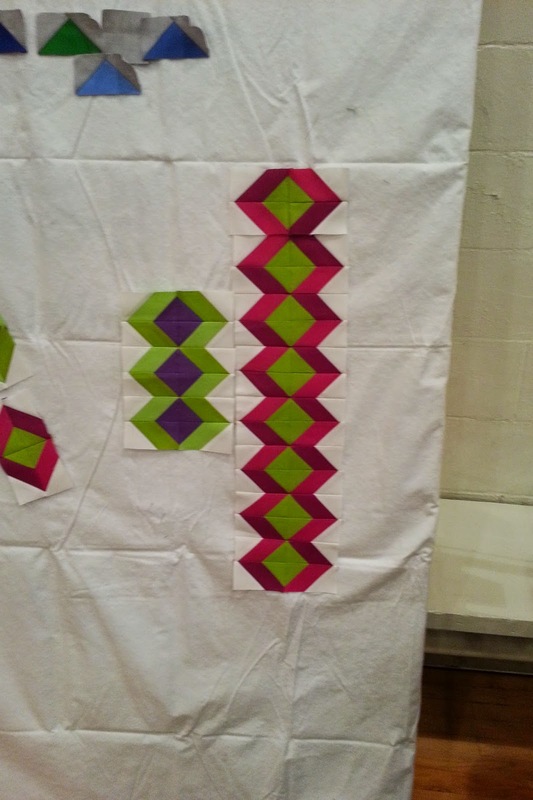 Amy had prepped the paper pieced blocks and led a demonstration. With our "A" sides and "B" sides, tops sorted from bottoms and directional prints all figured out, we headed to our machines. Production began in full swing. Despite our diligence, the blocks remain unfinished. Stay tuned for an informal sew-in to complete them. An epic Show and Tell is in store for May but Robin wanted us to see this gorgeous quilt that's off to her sister's and won't be here next month. Our own Mary did the long-arming! Beautiful! The retreat is only weeks away!! Next month bring your backlog of Show and Tell.